As promised, I have created a math concept or circle time board for younger preschoolers, specifically those in the 3-4’s age group, and possibly some two year olds may be ready, too. Around this time last year, I posted about making a math concept board for preschoolers and kindergarten aged children. 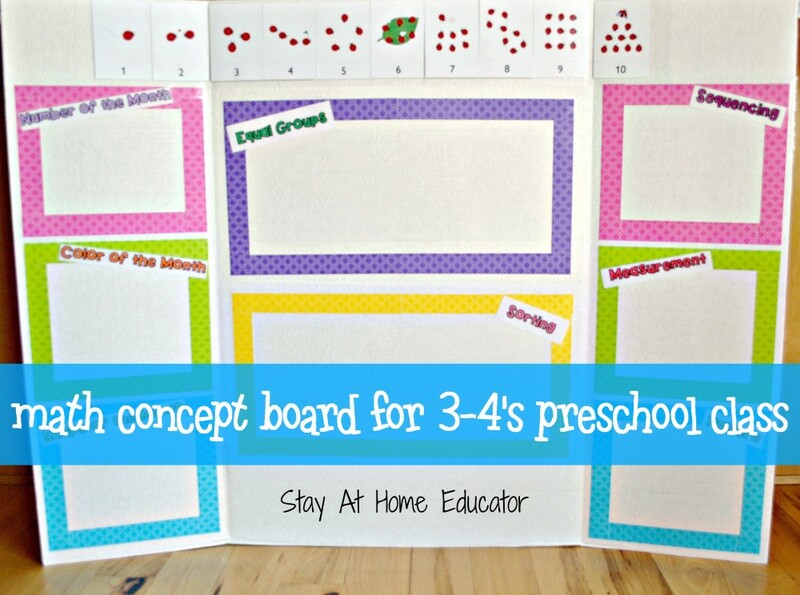 That board was a great success in my preschool class, and it received a lot of attention via social media, especially Pinterest. This year, however, I felt like I needed to create a new board as I am teaching 3-4’s this year. With the students being younger, introducing them to jumps on a number line and graphing, (like I included last year), seems less appropriate than some other mathematical concepts. That does not mean we will not explore those concepts, but this math board is full of concepts that will be taught with regularity throughout the academic year. As with all my other concept or circle time boards, I use a heavy duty presentation board, like this Elmer’s Premium Tri-Fold Foam Display Board. I do this because while I teach preschool out of my home, I don’t have a formal “school room”, and therefor it works best if everything is mobile and can be stashed away when we are not having school. If this is your first time, please join me regularly via E-mail in the right sidebar, Facebook, Twitter @StayAtHomeEdu, and Pinterest. For your convince, I have included some of my favorite products and resources I use in teaching my children and teaching preschool. Any purchase of these products goes directly to maintaining this blog. At the top of the concept board are number flashcards from 1-10. I chose to only display the number 1-10 because while I expose my 3-4’s to teen numbers, they are not my primary focus throughout the school year. 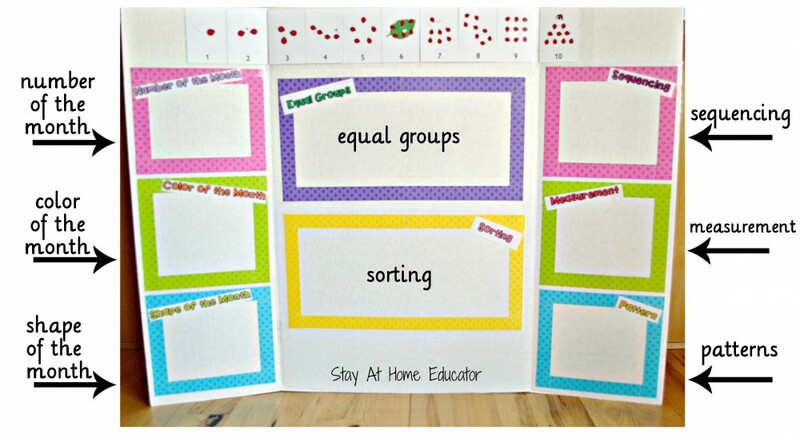 My primary goal to to help my young preschoolers reach mastery in number identification and one to one correspondence. So, we begin with only the numbers 1-10 and then progress to 11-20 as their skills designate. You can see it best in this image. Now, let me be clear, I do not start out the year teaching all of this at one time. Nor do I ever cover every concept during each math circle time once everything has been introduced. The first few weeks I only focus on the number, color, and shape of the month, in addition to one other concept. Each few weeks after that, as the needs of my students designate, I will introduce one more concept, until all the concepts have been introduced and practiced. It is also important to understand what I introduce my preschoolers to a range of activities that teach and reinforce the designated concepts on the board. I am constantly doing new concept board activities with them that practice the same concept. Throughout the school year, I will be sharing more of these activities. Hi! What do you use to stick items in the frames? Thank you! In this post I was using non-permanent double-sided Scotch tape, but now I have moved to using Velcro dots.